Adjustable Printed Nappy with pocket and double row of snaps. HIP SNAPS - to prevent leakage! The Inside is Soft Micro Fleece cloth. Our Nappies feel better than suede cloth! KindyNews Cloth Nappies are environmentally friendly cloth nappies that come in a variety of different colours and fashionable and funky patterns. They feature a waterproof PUL cover and a micro fibre insert that is extra absorbant. 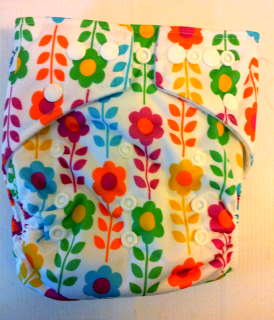 These modern cloth nappies are one size fits all which means they grow with your baby, saving you money along the way. They feature a 3 x 3 snap system on the front allowing you to easily to adjust the size and are perfect for babies to toddlers, 3kg - 18kg. KindyNews nappies are perfectly designed with your baby in mind. They are extremely breathable preventing nappy rash and have Twin leg gussets to prevent any leakage. Registered Post Via E-Parcel Australia Post. Tracking numbers can be monitored on the website www.austpost.com.au. Please also note in the event you are not home at attempted delivery, item will be carded and transferred to local post office. Check your letterbox for advice notices.